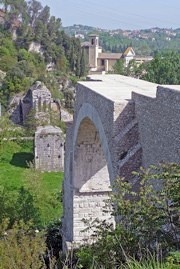 A chapel existed here from at least the 12th century, incorporated into a Roman structure that was probably associated with the nearby Ponte di Augusto. The chapel fell into disuse until 1714, when a hunter rediscovered it in the undergrowth. The rediscovery of a fresco of the Madonna and Child on the wall of the chapel excited particular veneration. 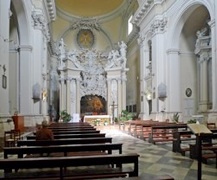 The present church was duly built, incorporating the rediscovered chapel behind the Baroque high altar, on the model of the Marian sanctuary at Loreto. It was consecrated in 1728. The facade, which was damaged by bombs in the Second World War, was rebuilt in 1946. As noted above, the original chapel survives behind the Baroque high altar of the church. This fresco, is the venerated image whose rediscovery in 1714 prompted the building of the present church. The Child blesses with His right hand and holds a scroll in His left hand that reads: "EGO SUM VIA" (I am the way). The fresco was detached in 1754 and taken in procession to the Duomo, where Cardinal Carlo Maria Sacripante crowned the figures using golden crowns donated by the Chapter of St Peter's, Rome. 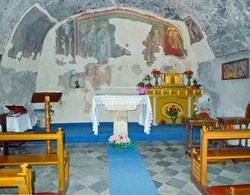 The fresco was then returned to its original location on the right of the back wall of the chapel. 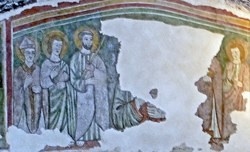 There is a free copy of this fresco in the Cappella della Madonna del Ponte in San Giovenale. ✴two lost figures and St John the Evangelist to the right. •very damaged frescoes of St Michael and a bishop saint, on the left.